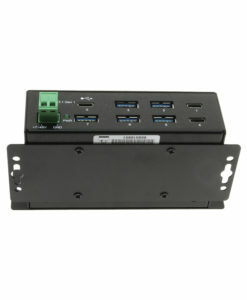 The USBG-4U2ML-PS Industrial 4-Port USB 2.0 Hi-Speed Hub is designed to be compact but mountable for stability. It includes a 12V 2A power adapter for high power consuming devices. The USBG-4U2ML-PS Industrial 4-Port USB 2.0 Powered Hub is a Hi-Speed USB 2.0 hub that includes a power adapter for power consuming devices. It is backward compatible with USB 1.0 and 1.1. It provides an out of the box industry standard that allows connection of up to four USB peripherals or devices to your USB ready PC or Mac. The USB 2.0 Hub incorporates Diagnostic LEDs providing port status for each port and power status. The industrial USB 2.0 hub is designed to be compact and provide quick and easy access, the Industrial 4-Port USB 2.0 hub provides four type “A” downstream ports for connection to additional USB peripherals, devices, or other USB hubs. A single type “B” upstream port connects the USB 2.0 hub to the host computer or another USB hub. This USB 2.0 Hub enables up to 127 devices for connection by cascading multiple hubs. Configuration of the hub is managed by the operating system once connected, the USBG-4U2ML-PS hub operates seamlessly with both Microsoft Windows and Apple Macintosh Operating Systems. Supports 4 external USB 2.0 Type-A connectors and 1 Type-B Upstream connector. Supports a 3-pin Terminal Block Connector for external power input from AC adapter.